For all of the music and art that actually happens at the two-day Eaux Claires Music & Arts Festival (June 16-17 this year), the last two years have seen plenty of activity before the fest, with local musicians and show organizers throwing all kinds of events all over the city on the Thursday before, hoping to attract festival goers who showed up early. Not to mention the festival itself has thrown shindigs of their own with Phil Cook both years – at the Whispering Pines campground in 2015 and The Lismore in 2016). However. This year a collaborative effort between Downtown Eau Claire Inc. and Blugold Radio 99.9FM will shine a collective light on all of the pre-fest events happening on June 15, when you can catch local music at different venues across downtown Eau Claire. They call it "Prex Claires." You'll find some of your local scene faves, and maybe a couple surprises as well. Several shows are already booked on the Thursday before, including OXBEAUX, the official pre-Eaux Claires concert at The Oxbow Hotel and The Lakely featuring The Shouting Matches, Field Report, Dem Yuut, and Idle Empress. And of course, we'll have a special night of Volume One's own Sounds Like Summer Concert Series in Phoenix Park that night, too. But there will be tons of other shows going on around town, and Prex Claires hopes to pull them all together under one big umbrella in an effort to get as many people enjoying themselves downtown as possible. The full slate of music events and lineups happening in downtown will be released soon, but participating venues will include The Oxbow, The Plus, The Mousetrap, The Brewing Projekt, Acoustic Café, Dive, and The Fire House. 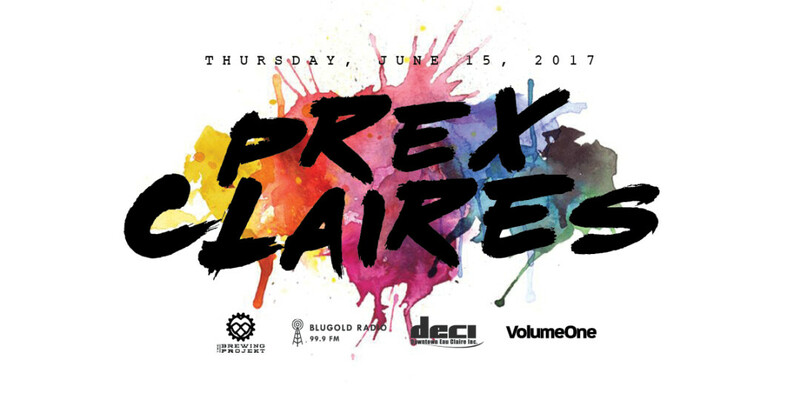 To stay up to date on Prex Claires happenings, follow along with Downtown Eau Claire, Inc. and Blugold Radio 99.9FM.